Somerville Nurseries Inc. is a family owned business that began growing Christmas trees in the Simcoe and Dufferin counties about 1950. The company initially started out growing various types of Pine and Spruce and eventually expanded into producing Balsam and Fraser Firs. Further developments led into the production of fresh wreaths, garlands and boughs to enhance the Christmas experience. Soon after the company was started, Jean Somerville’s Mother, who was an artist, came up with a stylized logo and corresponding name “Kriss Kringle”. This soon became the company’s brand name. It was felt that it would be fun to have a tag on the trees to mirror the spirit of the Christmas season. This Registered Trademark, “Kriss Kringle”, soon began to appear on our fresh cut trees. Today that brand still exists and is stronger than ever. All Somerville Nurseries, #1 and better trees receive the Kriss Kringle brand tag. 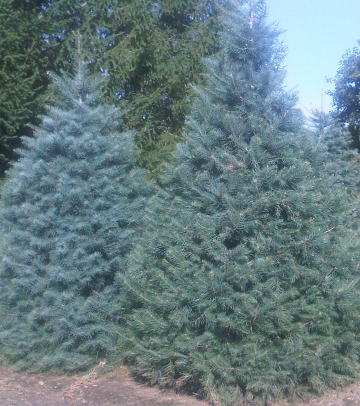 It guarantees you and your customers the finest, freshest, best quality Christmas trees. Flying the Kriss Kringle banner builds traffic for customers and lets the public know that there is a Kriss Kringle retailer in their neighbourhood. Today the company has developed into three divisions. These include, Christmas trees, ornamental nursery stock and bare root seedlings. Currently, we market over 4 million seedlings annually and have become the largest contributing supplier to the Ministry of Natural Resources “50 Million Tree Planting Program”. We are proud of our accomplishments to date and would like to acknowledge our exceptional and knowledgeable staff that bring expertise to all areas of the company, from growing the crop to delivering it to satisfied customers. Feel free to contact any of our staff with questions about our various divisional products. Best regards from the Somerville Family and the employees of Somerville Nurseries Inc.
Somerville Nurseries has over 1,500 acres of Christmas trees in production at any given time. Three to four year old seedlings are planted into large production plantations where they can take anywhere from 9-12 years to mature. All of our Christmas trees are grown in the Alliston / Everett area. At harvest time, all products are transported to our central shipping yard in Everett. Here, we are outfitted with specialized, storage facilities that provide shade for cut trees and commercial coolers to properly maintain the wreaths, garlands and boughs. Even though the month of November is the busiest time for the shipping of Christmas products, we are busy throughout the growing season performing the various cultural practices essential to producing quality crops and goods. During the spring, land needs to be prepared and planted. Summer brings activities such as pruning, insect and disease monitoring, nutrient applications and assessing inventories for the fall sales. Fall harvesting is an extremely busy time with so much to do in such a short period of time. After 65 years of practice we feel we have honed and perfected our various harvesting systems. With experience, great people and tremendous effort, we achieve excellent results. We encourage our wholesale customers to tour our production sites and farms. Please call to set up a mutually convenient time. Late summer is a great time to view the crop, for the trees have been pruned, and the grading tags have been hung. Give us a call, and come see why you want to become a Kriss Kringle retailer.